These are the famous words of Charles de Gaulle, at the time the General that entered Paris exactly 70 years ago to finish off the liberation of the city, an important symbol at the end of World War II. "Paris ! Paris outragé ! Paris brisé ! Paris martyrisé ! mais Paris libéré ! libéré par lui-même, libéré par son peuple avec le concours des armées de la France, avec l'appui et le concours de la France tout entière, de la France qui se bat, de la seule France, de la vraie France, de la France éternelle." The wall at the Ecole des Mines is not disintegrating from age or neglect. Here, you can see the reminders of the bombardment of Paris in World War I, on January 20, 1918, and also the fight for the liberation of Paris on August 25, 1944. The plaque commemorates Jean Montvallier-Boulogne who "died for France at 24 years old, in the combat for the liberation of Paris, August 25, 1944". Reminders are everywhere. Around the corner from us is the plaque commemorating André Perrin, a peace keeper, who "was killed by the S.S. on August 19, 1944". Because this is the 70th anniversary of the liberation of Paris, there are exhibits and special happenings throughout the city, especially of course in August. At City Hall, there's a really wonderful video and photography display of the liberation. Some of the video is of the fighting right at and outside City Hall, and it's surreal to be sitting there knowing what happened in this very spot 70 years ago, and then to walk outside to happy people, strolling and shopping and eating. 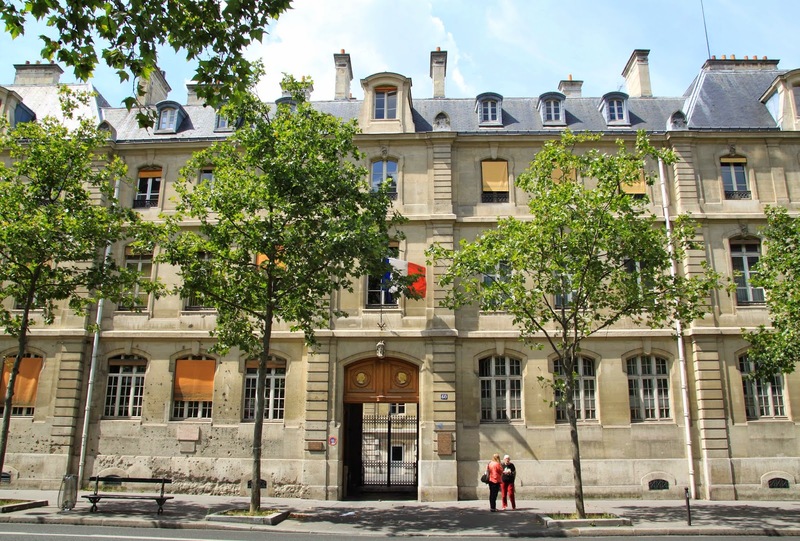 There's more at the Carnavalet museum and other spots around Paris as well. The official celebrations are dampened by rain, but the spirit is still high. While I'm talking about Paris, the reminders of the liberation aren't limited to Paris. Going through Auxerre in Burgundy the other day, I find myself driving along Rue du 24 Août which is subtitled "Libération d'Auxerre, 1944". A quick search of other streets named for the liberation on August 24th turns up Cannes, Corbas, Tournai, and the towns of Bourg-la-Reine and Boulogne-Billancourt for August 25th. I'm sure there are quite a few others, all of them remembrances of that time in 1944 when France -- the "real France" as de Gaulle called it -- finally took back France. Roquefort Pâte de Coings is a variation of a classic Roquefort cheese, but it's such a specialty, I feel it qualifies as its own cheese. Many of the best cheese stores make their own Roquefort Pâte de Coings, which means of course that the quality of both the Roquefort and the Pâte de Coings can vary. But no matter what, this is a beautiful, striking cheese that combines tangy, salty, sweet, creamy, fruity, and stinky all in one. It's an absolute treat for blue cheese lovers. It's a terrine, and of course you can make your own, if you're very, very good with a knife. Frankly, I find it much easier to buy mine. The Roquefort itself is, obviously, the most important element here. It's the second most popular cheese in France, after Comté (surprised neither #1 nor #2 is Camembert or Brie? ), and is arguably the most famous, the gold standard, of all blue cheeses. It's a raw sheep's cheese, ripened for at least three months and either injected or naturally aged with penicillium roqueforti. Roquefort has been mentioned since at least 2,000 years ago, when Pliny the Elder wrote about it. A thousand years later, King Charles VI gave special charter rights to the residents of the village of Roquefort because of their cheese. I could research, read, and write entire books about just Roquefort. Roquefort has to be one of the Frenchest of all French cheese, and even among the blues, it's a symbolic classic. But when your version of Roquefort is Roquefort Pâte de Coings, it's the Blue, White, and Red of the French flag that makes me want to connect it with this story. Plus, the speckled blue dots look very much like the bullet holes on the streets of Paris that still remain from the fight for its liberation 70 years ago.